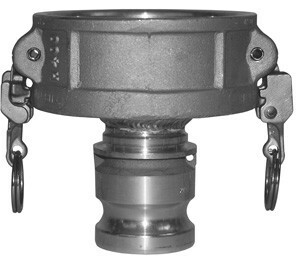 # DIXRDA4020EZ - Safety Reducing Couplers x Adapters - 4 in. x 2 in. Produced to Commercial Item Description A-A-59326B. Ergonomic. Rotating action helps keep the locking device free of debris. Designed to protect critical parts from impact and to withstand rugged use. Easier to use in restricted spaces. The coupler is the first size in the part number. Produced as a welded fabrication. Coupler x Adapter 4 in. x 2 in.